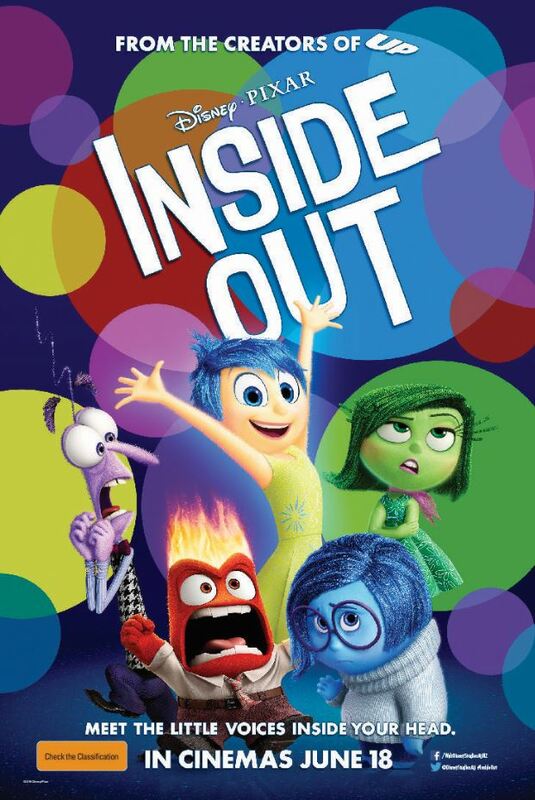 Meet the voices inside your head in Disney Pixar's latest movie, Inside Out. You'll me Joy, Fear, Disgust, Anger and quiet but influential Sadness, and find out how they all work together to ensure the happiness of 11yo Riley. The movie starts with the explanation of the intricate workings of the mind of an 11yo girl Riley (voiced by Kaitlyn Dias). She has a great family, great friends, is great at hockey and well, everything is great. She loves where she lives and her emotions are strongly controlled by Joy, who works over time to make sure she keeps all the other emotions in check to keep Riley happy. But when Rileys family move to San Francisco for a job opportunity for Riley's Dad, life couldn't be more different to her old life, but Riley, with the help of Joy does her best to stay happy. But the waves of emotions from all the changes sees Sadness, who was previously very quiet, start to behave erratically. The final straw comes when Riley's Mum, asks her to be happy (when perhaps she isn't) to help Riley's Dad who is having a hard time with his new job. We then see Sadness become more erratic and both Sadness and Joy start working against each other and find themselves thrown from Head Quarters (Riley's head) complete with some of Riley's core memories and we start to see what happens when a person is absent of sadness and joy, and the destructive behaviour that follows. Joy and Sadness are both desperate to get back to Head Quarters to help Riley as they see her personality islands start to crumble down, and her train of thought running off the rails. They learn about the important role they both have in ensuring Riley's happiness - and keeping all the emotions in balance, together. So with just Anger, Fear and Disgust at Head Quarters, Riley's behaviour becomes destructive. As Joy & Sadness struggle to get back to Head Quarters, we see Sadness start to smile, and Joy also starts to realised it's not as simple as just being happy, as she finds herself gripped by sadness when she can't reach Riley. We also see the importance of core memories to maintain happiness too. You'll have to watch to find out if Joy & Sadness find their way back to Riley to help her - but we challenge you to look deeper into this movie and think about what this movie is trying to teach us about preventing and maintaining a healthy emotional balance both in ourselves and our children as it really is a family and community effort, and thinking about the role that joy and sadness play together in ensuring happiness. Disney Pixar have done an amazing job at identifying a key issue in our society and creating a fun, bright, animated perception of the emotional processes that go on inside our heads in such a way that it appeals to both children and parents of young children - to help us think about how we can all better manage our emotions and help teach our children to manage their emotions also. While the deeper meaning will probably be lost on younger children, boys and girls alike will still love the bright colours and animated characters and parents will love laughing at themselves, with lots of gags around the typical thoughts of Mums, Dads and kids. This is a fantastic movie for the whole family and we give it extra points for the important underlying message about the importance of a balance in emotions and preserving core memories to help us through lifes stages. It certainly got me thinking that it isn't as simple as wanting our kids to be happy, and that it's more important to encourage our kids to express their emotions and ensure their personality islands remain intact to support them until the sadness subsides. Oh and be warned it's a real tear jerker.